Francis Flynn was born in Greene, New York on October 6th, 1864 to Edward Flynn and Mary Ann (Casey) Flynn. 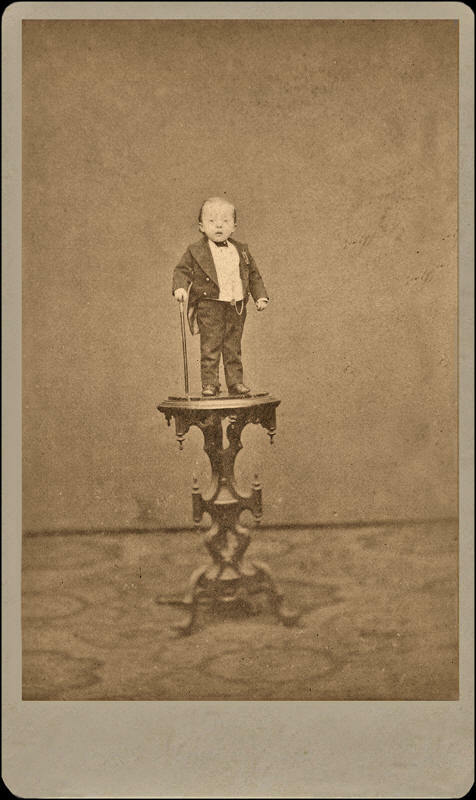 Francis's highly unusual stature was apparent quickly, as he never grew much after his birth. By the age of 4 he was already a noted celebrity at 23" and 12 pounds. He was exhibited at various locations around New York State. His career as a showman began in earnest at the age of 8 when he traveled to England with P.T. Barnum. He "married" another little person at the age of 12 (though his entourage claimed he was much older) in Manchester, a publicity stunt which nevertheless resulted in a life-long companionship with Millie Edwards. "General Mite" is still considered one of the smallest human beings ever documented. His adult height was 27" and his weight around 12 pounds. He presented a stage show in which he rode a bicycle, sang, dressed in various costumes, and told jokes. By all accounts he was a lively, talkative, sparkly little fellow who was a consummate showman. He worked with another famous little person, Lucia Zarate, briefly joined the Liliputian Opera Company, and toured with his wife Millie. He met the Queen of England and many other dignitaries. Francis traveled to Australia in 1890. By then, the enthusiasm for General Mite's type of show had waned in the US and Australia was a common destination for circuses and sideshows. He and Millie toured all around that country. In October of 1898 General Mite presented his show in Broken Hill, Australia, a small but vibrant mining town in the Australian outback. He died there on October 5 at the age of 25.